If you are looking for a special gift for pretty much anyone, look n further than one of the luxury robes offered by Telegraph Hill. The robe I chose was the Chocolate Seersucker. It is made of 100% miccrofiber, and may be one of the most comfortable garments I have come across. The microfiber was not only great feeling but was a very beautiful color. The terry lining was the perfect feel without being too thick. The weight is heavy enough to cause it to drape nicely. This is a perfect choice for anyone who dislikes the bulkiness of a total terrycloth robe, yet wants coverage and comfort. They have a brilliant website that is very user friendly. 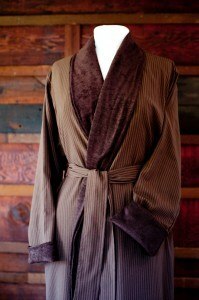 If you are looking for a luxurious robe for an affordable price for yourself or as a gift you will not be disappointed.